Fasten your seat belts and get ready for fun!!! 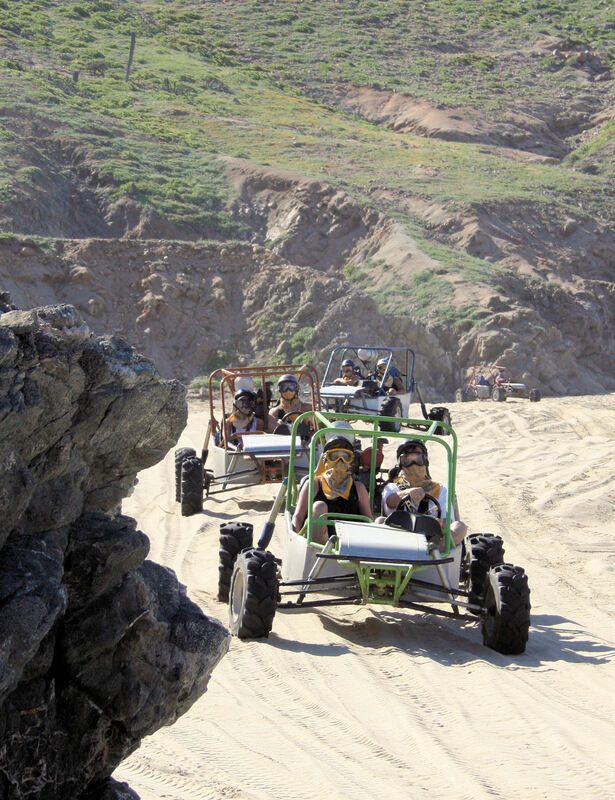 Hop on your Fully Automatic Xrail Buggy for the safest off road fun ride you have ever experienced. Explore Cabos San Lucas's magical transition from desert to ocean as you travel through mountains and canyons at Migrino sandy river bed making your way to Half Moon canyon and TreeRock. After a refreshing break, continue to La Candelaria; a 300 year old aboriginal village. At the village cemetery, you will encounter the headstone of Rafael Salvatierra which rested in peace at the age of 130 years. Here your guide will enrich your experience with the knowledge of local history. Step on the gas, enjoy a thrilling ride until you reach the river's delta where the desert merges with pacific ocean before you make you way back to the starting point for a gourmet Mexican Buffet and refreshments. $5 usd per person park entrance fee & Optional $35 usd damage insurance not included with tour cost. To best enjoy this excursion we recommend you to bring clothes you can dirty. Drivers must present a valid Driver's license and be at least 16 years of age. We welcome passengers from 6 years old and above. People suffering from the following: back injuries, heart conditions, epilepsy or women who are pregnant can not participate at this tour. All guests must wear closed toed shoes. The duration of the actual drive is approximately 1.5 hours. Requires 2 people on the same reservation.